← Are you Dreaming of a Crafty Christmas? Which Tecre Cutter is right for you? It’s no secret that Tecre is on the cutting edge of developing quality button making and cutting equipment. But if you are overwhelmed by your options, we would like to help you cut to the chase. 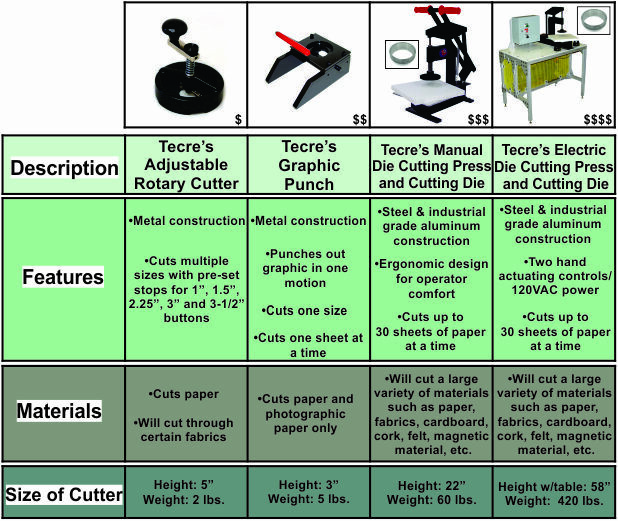 The following table highlights each cutter’s key characteristics so you may determine which one will make the cut for you! Sign up for Tecre’s blog updates to be sent directly to your email! This entry was posted in Cutting Equipment, Die Cutting Press, Graphic Punch Cutter and tagged Adjustable Cutter, Cutters, Cutting Equipment, Cutting Press, Die Cutting Press, Die Press, Electric Die Cutting Press, Electric Press, Graphic Punch, Rotary Cutter. Bookmark the permalink. One Response to Which Tecre Cutter is right for you? Pingback: The Adjustable Rotary Cutter: Is it right for you? - Tecre Co., Inc.Tecre Co., Inc.